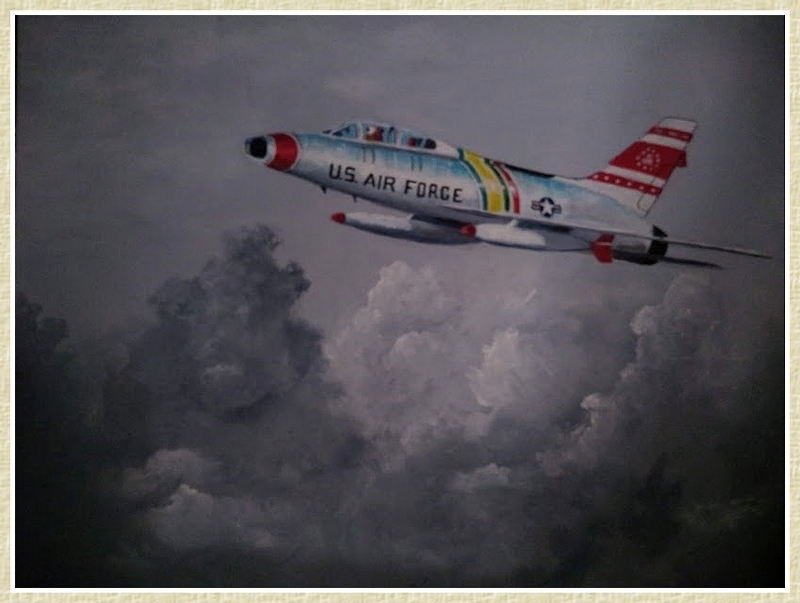 Currently this painting is on loan to the Chico Air Museum for 3 months. After that time it will be for sale. This is an acrylic on canvas, apx. 18X24, finished March 2nd, 2019. The F-86 was introduced early in the Korean War to take on the Soviet built Mig 15’s. This painting is in hyper-realism and much research was invested before the first brush stroke. Fortunately I have unlimited access to an actual F-86, so that helped speed up my research. The F-86 is a subsonic jet, but Chuck Yeager claims he broke the sound barrier during a steep dive in 1952. In theory it is possible, however that stunt was not duplicated because of the extreme danger involved. The F-86 held up fairly well against the Migs, which meant the two aircraft were remarkably close in performance; so it really came down to the pilot skill, training and luck. The F86 v Mig 15 had a kill ratio of 5.6 to 1, but against highly skilled Soviet pilots that ratio fell to 1.4 to 1. The Sabre carried rockets and bombs as well as six .50 cal. machine guns on either side of the nose section. This was formidable firepower, although the Mig was just as lethal. It carried 3 cannons, one 37 mm and two 23 mm. One hit by these cannon rounds could knock down a Sabre. The first prototype flight of the F86 was in 1947, but it didn’t make into battle until 1950 over Korea. It was finally retired in 1980. The F100 Super Sabre followed the F86 and it was supersonic. It had a service life from 1954-1971. The following Super Saber painting is one I completed a few months ago. As always, feel free to send me your comments, good or bad, I enjoy hearing from you and criticism helps me learn. 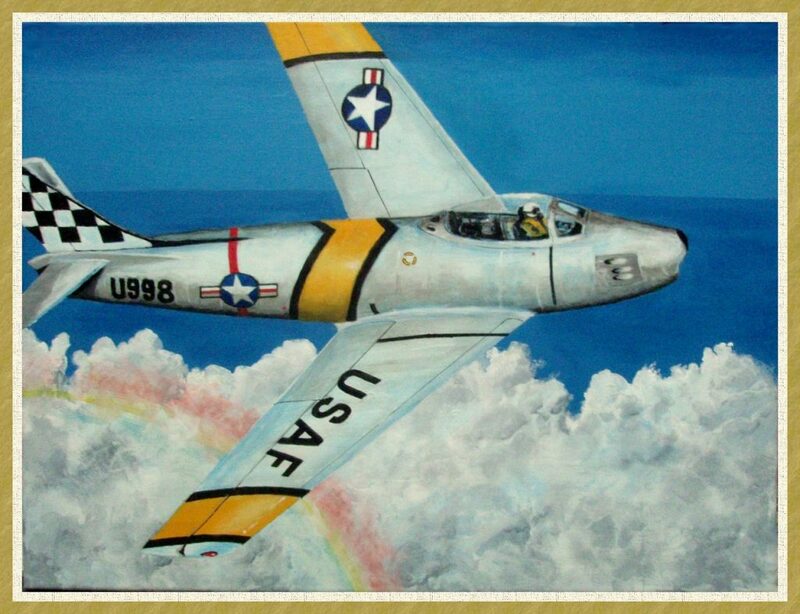 This entry was posted in Art and tagged aviation art, F86 Sabre Jet, Jack Lee Art, Jack Lee's Sabre jet. Bookmark the permalink. Why is it index #106b? Ted, it’s so I can do a search on Google from other computers to show this painting, but without hitting a lot of similar named paintings. F-86 and Sabre are too common.